That time of year, where the gaming industry flocks to LA for the biggest expo in the calendar has once again come around. This year, hopes were high for some news on new IP’s and new hardware. With Microsoft taking the lead and getting proceedings under way, things should have been looking up. After all, this years show has been made more accessible than ever, with live streams on most dedicated gaming websites and even Xbox Live broadcasting Microsoft’s presentation. So you would have expected them to make it a show to remember. In some ways, you could say that’s the case, but for all the wrong reasons. Starting things off was a trailer for the forthcoming Halo 4. This lead into some gameplay footage, and while it looked rather impressive, do we need another Halo game? The series has gone down hill significantly since the franchise debuted on the 360 with Halo 3. Once the initial awe at the lush scenery had subsided, the demo felt it had outstayed it’s welcome. Then there was a surprise revelation of Ubisofts’s Splinter Cell Black List. The surprise being that anyone would care. Granted the game could be decent, but a multi platform title is not the sort of announcement you want from a first party publisher, yet the reason being is that it was shoehorned in under the obligatory ‘Better With Kinect’ business. The only people who believe that are MS. Shouting at the TV is not my idea of playing a stealth-ops game. There were other Kinect games also introduced, including a catch up on the game no one wants, Fable Journey, which was announced at last years show. And in FIFA 13 you’ll be disciplined for gaming tourettes. Yay Kinect! Then it was announced that Xbox will start integrating with tablets and smart phones etc. ‘About time!’ no one cried. 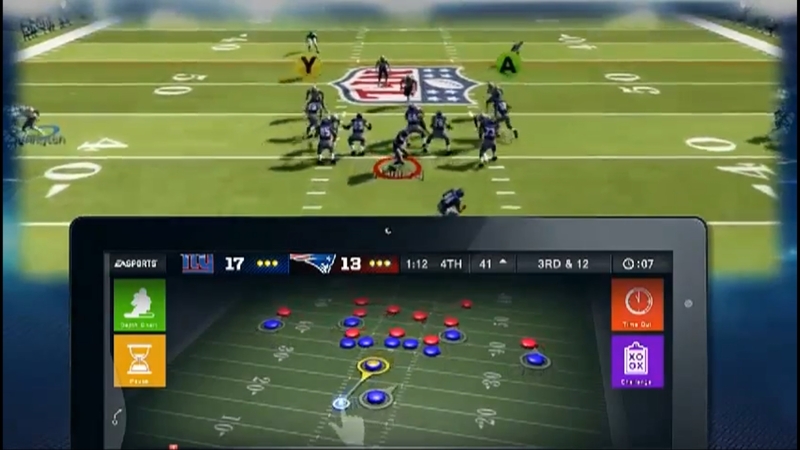 This new feature, named Smart Glass, enables players to look up extra content on films or TV shows they are watching via Live (there’s nothing more I enjoy more mid-film than looking up random facts about, completely disconnecting me from what I’m watching), and it was also shown being used in conjunction with Madden 13. Going through all sorts of touch screen tactics displays and other touch screen nick-nacks. Which is fantastic if you’re Gary Neville and it’s Monday Night Football, but otherwise seemingly pointless, adding unnecessary labour to the game! 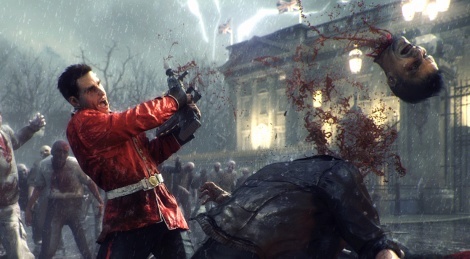 Once all that drivel had passed, gameplay footage of Resident Evil 6 was shown, which started off quite nicely, with Leon taking on hoards of zombies. And then it descended into QTE button bashing. Granted it was less than 5 minutes of footage in a supposed 30 hour + game, so it shouldn’t be written off just yet. We were also treated to a teaser for Gore Verbinksi’s new game, Matter, and a new IP called Lococycle, which seemed to get people excited. 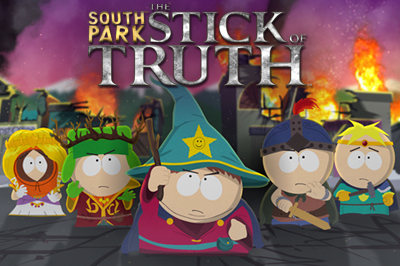 This was followed by footage of The Stick of Truth, the latest South Park game, presented by none other than Matt Stone and Trey Parker, promptly ripping the piss out of the Smart Glass, and almost as quickly having to leave the stage. It was all down hill from there, as Matthew McConaughey’s evil Nike exec twin was flogging some rubbish looking fitness game which was given far too much air time. Not only that, there was quite possibly the worst musical act I’ve had this misfortune of seeing in the form of Usher, who was ‘singing’ and dancing to promote Dance Central 3. Despite the Dance Central games being the only titles to have really worked well on Kinect, I’m sure the worlds gaming press didn’t need treating like they were 12 year olds. Everyone has their own music tastes, but Usher? Christ on a bike! There was other Kinect stuff, and a bit of footage from Tomb Raider in which Lara seems to beaten 6 ways from Sunday in every other scenario. Also, MS closed with gameplay footage of COD Black Ops 2, to bring the show to a disappointing close. EA followed with their conference, and aside from their usual sports franchise annual updates, the only announcements of note were Dead Space 3, which appears to be heading further down the action route, and adding co-op to proceedings (that really helped Resi 5, didn’t it?! ), Sim City, an update of the age old classic, with much more detail and depth, and finally, EA have acquired the rights to the UFC brand. THQ having sold the licence, despite making a decent game with Undisputed 3. Following on from EA’s conference was Ubisoft. Due to expectation being for nothing but sequels, Ubisoft seemed to pull it out of the bag. We saw several games being introduced including the rather tropical looking Far Cry 3, an Avengers Assemble CG trailer for Wii U, the superb looking Assassins Creed III and curious looking Wii U exclusive, Zombi U, which sees the undead take over London Town, although the music over the trailer seemed somewhat inappropriate having taken part in Jubilee celebrations not an hour prior to the presentation! HCF’s particular favourites of the presentation were Rayman Legends which looks like it could be an improvement on the already fantastic Rayman Origins, and looking just as chaotic, but with an added twist using the Wii U’s touch screen controller, and not just stealing the show, but possibly besting anything else in E3 was the announcement of Watch Dogs. As described by Ubisoft, “Watch Dogs blends cutting-edge technologies and sophisticated game design into a realistic and living open world where players must use any means at their disposal to take down a corrupt system.” And while that brief press release doesn’t really let on what the game is like, it’s stunning to look at and its technological concept is very interesting indeed. After Microsoft’s amazingly poor showing, all the other 2 of the big 3 had to do was show up, right? Well in Sony’s case, it seemed they had his in mind. This time last year we were introduced to PS Vita and some great looking PS3 exclusives. 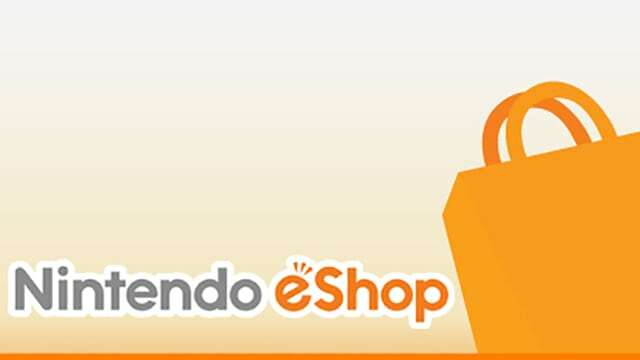 Expectation was high that we’d see a lot of new titles and support for the seemingly neglected handheld. Well other than it being used as a ‘cross compatible’ controller for Little Big Planet 2, there’s not much to write home about. Basically a couple of spin-offs of Black-ops and Assassins Creed III. And that’s pretty much it. With regards to exclusives, Quantic Dream announced their next IP, and given how engaging, exciting and generally brilliant Heavy Rain was, it’s a game I look forward to already. Beyond: Two Souls, is another title from the developer to use motion capture, with it looking much better this time around, and featuring none other than Ellen Page in the games lead role. Other than a cut scene, there’s nothing to indicate what it will actually play like, however. If, like me, you have no time for the likes of Super Smash Bros., you probably won’t be interested in Playstation All Stars Battle-Royale. Which although they will no doubt disagree with, it looks like a rip off of the former, only swap Super Mario for Nathan Drake and Link for Parrappa The Rapper. And given how long it’s been since we saw a game featuring the hip-hopping dog, goes to show how much they’re scraping the barrel for this one. Another God Of War game was shown. God of War Ascension is seemingly more of the same. Sony also spent far too much time showing off Ubisoft’s Far Cry 3, which looks pretty decent, but go either way. Trying make the PS Move seem more than a lightgun with a bulb on the end, Wonderbook was unveiled. Using the Move controller and Eye camera, Wonderbook is an augmented reality game, which looks like it’s aimed at the younger, more casual crowd. It is an actual book, which the Playstation Eye brings to life on the TV screen. In conjunction with author J K Rowling, the example used was a book of spells from the Harry Potter universe. Admittedly it looks quite good, but will it be more than a quick wearing gimmick, or might Sony actually produce something that the others have failed to do in producing an immersive motion control experience? 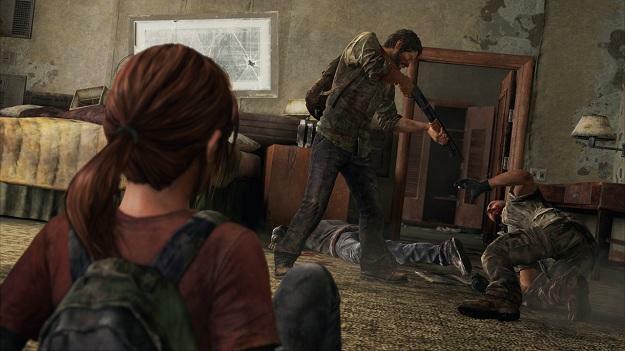 The big show stealer however was always going to be Naughty Dog’s next offering, The Last Of Us, the post-apocalyptic action-thriller, impressing the audience with a rather Uncharted-esque, violence packed gameplay demo, culminating in shotgun assisted decapitation. Anyone would think us gamers were blood thirsty… Despite being somewhat underwhelming, Sony certainly showed Microsoft up this year. As I said, all they had to do was turn up, which you would think the same would be said for Nintendo, given they’ve got a new console on the horizon. What could go wrong? Check out part two of our coverage and find out!